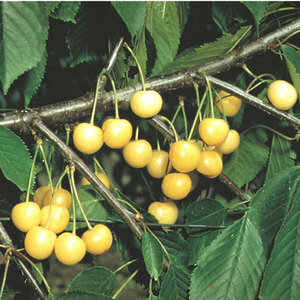 Sweet Cherry Vega fruit trees - A new white cherry well worth a try if you want something a little different. The fruit size is very large often over 12 grams in weight. Exquisite flavour. Picking time late July. I love receiving a crate of Blackmoor trees as I know they will always exceed my expectations. Today is no exception. Thank you very much for my great Vega!